SUMMARY: Acute suppurative thyroiditis is an uncommon disorder, which has been associated with pre-existing thyroid disease, especially a multinodular goiter. We describe a case of a woman who presented clinically with an acute inflammatory condition of the neck. On CT examination, she had a triad of a multinodular goiter, a unilateral hypopharyngitis, and a surrounding cellulitis. We suggest that the constellation of these imaging findings should alert the radiologist to the diagnosis of acute thyroiditis. Acute suppurative thyroiditis (AST) is an uncommon inflammatory disease, most often caused by pyogenic bacteria.1–3 Pre-existent thyroid disease has been reported in 50%–100% of the cases, most often in a multinodular goiter.1,2 A fistula from the apex of the pyriform sinus to the thyroid gland has been identified in a few cases; however, almost all of these cases were in children with a history of recurrent thyroid infections.4 To our knowledge, in most cases of acute thyroiditis affecting adults, no such fistulous tract has been reported. In most cases, it is believed that the infection may reach the thyroid gland via a hematogenous route. We present a case of a woman who presented for the first time in an acute condition with a swollen inflammatory neck and who, on CT, had a multinodular goiter, surrounding unilateral cellulitis, and a unilateral hypopharyngitis. It was the constellation of these findings that suggested acute thyroiditis. The patient was a 38-year-old woman who presented with a 2-week history of progressively worsening dysphonia and dysphagia, with left-ear pain on swallowing. When neck swelling developed, she saw her local physician, who diagnosed an acute pharyngitis and a benign thyroid cyst. She was started on amoxicillin and clavulanic acid (Augmentin) and prednisone, but after 5 days with no improvement, she presented to our ambulatory emergency department, at which time she could not swallow solid food. There was no history of trauma, neurologic complaint, vomiting, or shortness of breath. No signs or symptoms of thyroid storm or hyperthyroidism were present. Her vital signs were normal. There was visible and palpable swelling over the left anterolateral neck, and the left lateral nodes were tender and enlarged. Findings of the remainder of her physical examination were normal. The initial clinical assessment resulted in a differential diagnosis that included a goiter with possible intraglandular hemorrhage and lymphadenopathy, an infected branchial cleft or thyroglossal duct cyst, and pharyngitis with a possible neck abscess. The patient was treated in the emergency department with dexamethasone 10 mg intravenously every 6 hours and antibiotics for typical oropharyngeal bacterial pathogens as well as Streptococcus and odontogenic anaerobes. Neck pain was formidable and managed with ketarolac (Toradol), oxycodone hydrochloride with acetaminophen (Percocet), and morphine as needed. Her pain level was 10/10 (1 lowest, 10 highest) at initial triage but declined to a maximum of 3/10 during the next 12 hours. Her laboratory values were within normal limits. A chest radiograph showed a superior mediastinal mass causing right tracheal deviation thought to be due to a substernal thyroid. A contrast-enhanced CT scan of the neck showed edematous swelling of the left hypopharynx and a supraglottic larynx. Cellulitic changes extended caudally in the left neck to surround a multinodular goiter (Fig. 1). There was no airway compromise. These imaging findings suggested that the diagnosis could be an acute thyroiditis. Serial axial CT scans from a cranial to caudal direction. A, Swelling of the left hypopharynx and left aryepiglottic fold with infiltration of the adjacent left-neck fat planes. The upper edges of the displaced thyroid gland (arrows) can be seen. B, Extension of the slightly low-attenuation edematous disease caudally in the neck. The hypopharynx and thyroid gland are affected as is the left paraglottic space of the larynx (arrow). C, Inflammation extends into a multinodular goiter. She was transferred to the ear, nose, and throat service and maintained on intravenous hydration, pain management, steroids, and antibiotics. Results of a sonography-guided fine-needle aspiration of the thyroid gland were consistent with a goiter with cystic degeneration; no malignant cells were present. No fistula was identified on the sonographic examination. Endoscopy also failed to reveal a pyriform sinus fistula. She was discharged after 1 week to be followed by her local physician and an endocrinologist for thyroid-function monitoring. Her discharge medications included narcotic analgesics as needed, methylprednisolone (Solu-Medrol) dose pack, and levofloxacin (Levaquin) 500 mg daily for 10 days. She remained symptom-free except for the goitrous mass in her neck, and 4 months later, she was readmitted to the hospital for a thyroidectomy. At this time, a barium swallow was performed (Fig 2), which showed no evidence of a fistula. At surgery, her goiter was removed, and again no fistulous tract was identified. 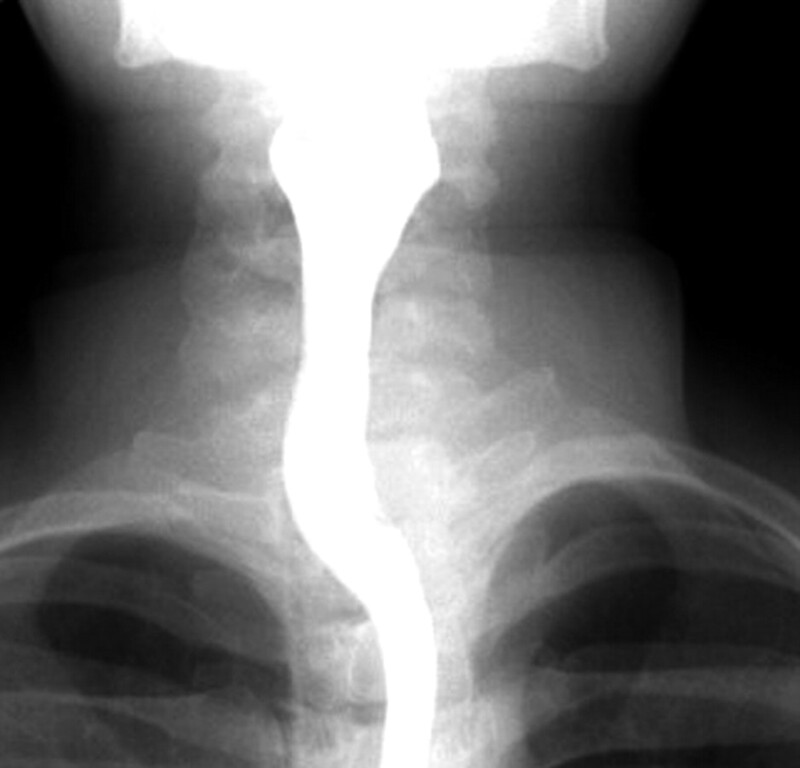 Frontal spot film of a barium swallow shows a normal anatomy of the pharynx and the upper esophagus with no evidence of a fistula. In general, the thyroid gland has a relatively high resistance to infection. Multiple factors contribute to this resistance, including the protective fibrous capsule of the thyroid, an extensive venous and lymphatic drainage, and a high concentration of iodine.5,6 On the other hand, the highly vascularized nature of the thyroid gland can lead to its seeding from hematogenous sources. The most common route of spread is very likely hematogenous from a pharyngitis. However, a few cases have been reported with a congenital fistula to the thyroid gland from the apex of the pyriform sinus. When this occurs, the fistula likely represents a rare fourth branchial anomaly, and these reported cases share certain findings in common, including onset in infancy or childhood, left thyroid lobe involvement, and frequent recurrences unless surgery is performed.4 Because our patient developed her thyroiditis as an adult, had no prior history of such episodes, and has had no subsequent episodes, it is unlikely that she had such a rare fistula. Furthermore, no fistula was identified on CT, sonography, barium swallow, or at surgery. This case demonstrates that when the triad of a multinodular goiter and a unilateral hypopharyngitis with a surrounding cellulitis is present, the diagnosis of acute thyroiditis should be considered by the radiologist, because this diagnosis may not be initially considered purely on the basis of the clinical presentation. Although in children AST may be associated with a fistula, in adults such a fistula is rarely reported, and the spread of infection from the pharynx to the thyroid is believed to be via a hematogenous route. Accepted after revision March 22, 2009.